One never becomes a good cook or chef without mastering the basics. I love to cook. I especially enjoy the challenge of learning new techniques whether for making a stew or baking a pie. Composing and using an exotic combination of spices sends me to culinary heaven. However, what I love most is using those new experiences over and over again, not in the same recipe but in variations of the original. The repetition enables me to see patterns in recipes, build bases from which other recipes are born and most importantly allows me to perfect techniques and not learn just a rote recipe. And that’s the basis of creativity. At work I evaluate patterns, patterns within patterns and then form the entire picture. What fascinates me is that although I may be familiar with individual patterns, when they are combined, they form a totally new landscape of complex brain activity. And so it is with cooking and baking. Take the soufflés that we have posted in the past. A few basic ingredients like egg whites and sugar combine to make the meringue that adds airiness in a soufflé. Combine egg yolks, sugar, milk, flour and vanilla in a certain way and you have crème pâtissière. Combine them both with tropical fresh fruit juice and a passion fruit soufflé graces your dessert table. Make that crème pâtissière again, but this time layer it between puff pastry, round it off with fresh raspberries and voilà – raspberry millefeuille. When you’ve done it once or twice, preparing ramekins for a soufflé is second nature. Know the basics and you can create anything. No limits. I marvel at the chefs on those cooking programs in which they are given baskets of the strangest food combinations from which they must prepare an appetizer, main dish and then dessert. Think about it. They go back to basics. A technique or preparation that unites those sometimes far-fetched food components into sensational dishes. All of this being said, today’s post is sort of a review of the basics and a variation on a theme. 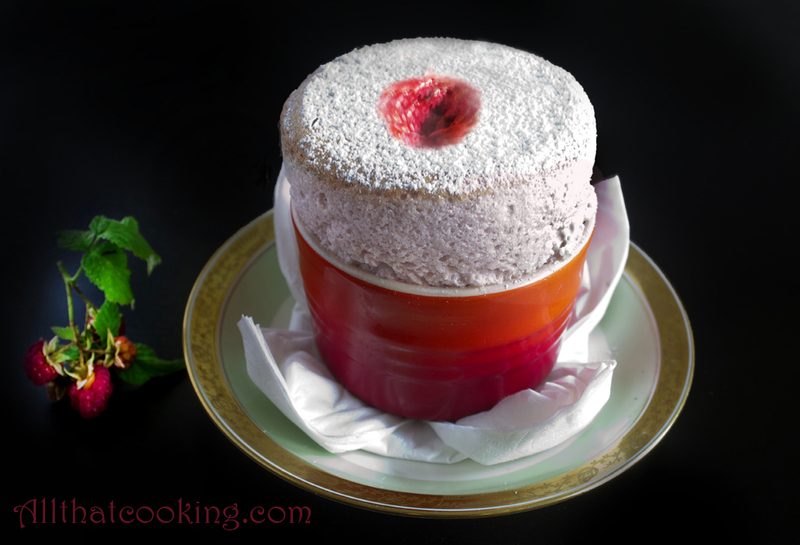 This decadent, delicate soufflé combines meringue and crème pâtissière (two basics that should be in everyone’s bag of culinary tricks) with a sweet/tart sauce made from fresh summer raspberries. Go ahead. Practice the basics. I guarantee, there’s nothing far-fetched about this sensational soufflé. 1. Place berries in a medium size bowl and use a potato masher to crush them. Press the crushed berries through a sieve then mix the juice with the sugar. Cover with plastic wrap. Keep at room temperature. 1. 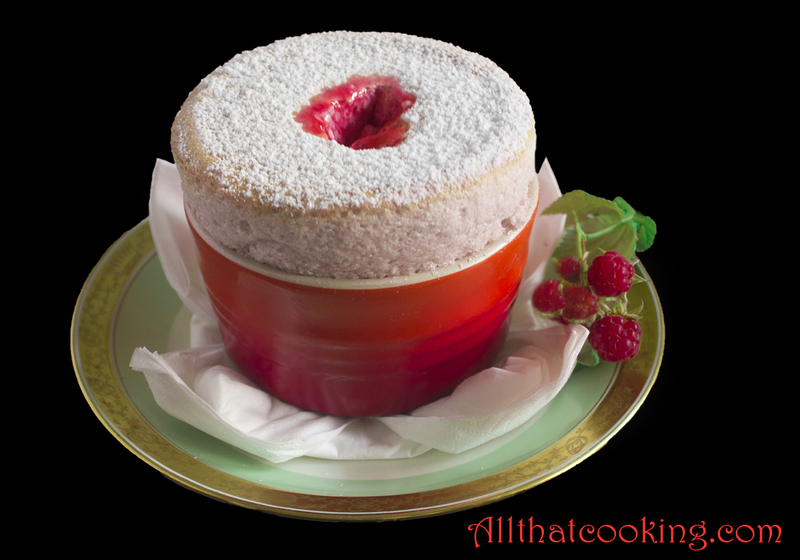 Place crème patisserie in a large bowl and gently whisk in raspberry juice until all mixed. 2. Use a hand whisk to gently whisk one third of the meringue into the raspberry crème. 3. Use a spatula to very gently fold in the remaining meringue. 4. Remove ramekins from the refrigerator and fill each 1/4 full with the raspberry crème meringue. 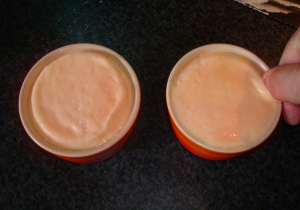 Briskly tap the bottom of each ramekin on the table to settle the crème. Then fill with remaining crème. 5. Use an icing spatula to even the surface. Make sure they are filled to the top. 6. Run your thumb around the inside edges of each ramekin to remove the crème from the sides. This will help the soufflés to rise. 7. Place ramekins on a cookie sheet and slide into the middle of the preheated oven. 8. Bake 12-15 minutes, until puffed and golden. Do not open the oven door until done. 9. Remove from oven and sprinkle tops with confectioners’ sugar. 10. When you serve the soufflés at the table, use a teaspoon to poke a hole about 1/2 way down each soufflé and pour in 1 tablespoon of the raspberry sauce. Gallery | This entry was posted in Basics, Dessert soufflés, Desserts and tagged crème patisserie, dessert souffle, meringue, raspberry soufflé, soufflé. Bookmark the permalink. Wow that looks fantastic! 🙂 I’m stunned! So glad you like it! It really isn’t difficult to make either. Perfection! I can’t wait to give it a try too. Thanks for sharing! It looks so lovely and delicate. 1 year ago i succeeded in making crème pâtissière and i was lucky it did not sink in the center like our Bardarbunga, a subglacial volcano is doing now, (300 km from Reykjavik), with possible erruption. But like you said it is good to have the two basics, meringue and crème pâtissière when i make the Raspberry Soufflé. Wow this looks so light and refreshing!